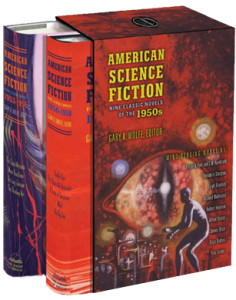 By the 1950s, science fiction had been writing for years about atomic power and the possibility of nuclear destruction, but after August 1945 these speculations became the matter of urgent public anxieties, exacerbated by the Soviet development of similar weapons, the testing of vastly more powerful hydrogen weapons, and the emerging Cold War. The Bulletin of the Atomic Scientists seemed to invite apocalyptic thinking with the introduction of its famous “Doomsday Clock” in 1947, and the 1950s was peppered with cautionary mainstream bestsellers such as Philip Wylie’s Tomorrow! (1954), Nevil Shute’s On the Beach (1957), and Pat Frank’s Alas, Babylon (1959). A renewed interest in rocketry and space exploration was reflected by films like Destination Moon (1950), enthusiastic articles in popular magazines like Collier’s, and even theme park rides like Disneyland’s “Rocket to the Moon” (introduced in 1955). The launch of the first artificial satellite, Sputnik, by the Soviet Union in 1957 lent a sense of public-policy urgency to space exploration as well as to nuclear fear.